Sandy Cove, Nova Scotia. Photo taken by Dennis Jarvis, 2012. Sandy Cove is situated north across the bay from Oak Island. Do you love moderate temperatures, crisp sea air, and pristine island views? Are you inspired by a good old-fashioned mystery, one that has yet to be solved? Are you in search of a romantic honeymoon with a touch of intrigue? If you said yes to any of these questions, then may we recommend a honeymoon trip to Nova Scotia, with a tour of Oak Island thrown in for good measure? 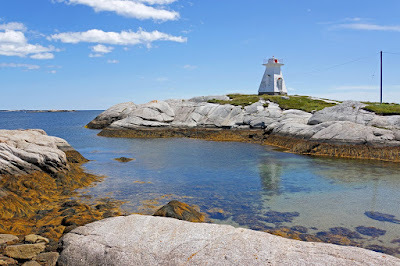 Nova Scotia is a northern paradise, offering a wide range of indoor and outdoor activities. On a beautiful day, tour the zoo, visit a wildlife park, go to a fun park, or spend the day on the water. Nova Scotia offers year-round surfing, tidal bore rafting, kayaking, whale watching, hiking, and golfing. If the weather is sour, then spend the day indoors. Visit the Science Centre, one of the provincial museums, or go see a play at one of the local theatres. Or visit an art gallery or boutique artisan shop. Whether you enjoy shopping, sightseeing, water sports, or boating, Nova Scotia has it all. And if that is not enough to intrigue you, then Nova Scotia also has a 200-year-old mystery that has yet to be solved. The seat of this mystery lies on a lush, 140-acre island off the southwestern coast of Nova Scotia. In 1795, Daniel McGinnis discovered an indentation in the ground on the island. He and his friends began digging in the area, only to discover a deep and mysterious man-made shaft. After boring through layer after layer of oak-log platforms, charcoal, putty, and even coconut fibers, the boys hit a stone slab that was engraved with a message of symbols and shapes. They stopped digging for the night, thinking to return and continue their investigation the next day. However, when they returned to the site the following morning they found the deep shaft completely filled with seawater. No matter how hard they tried, they could not continue digging. From that day to this, men from all walks of life throughout progressive centuries, including President Franklin Roosevelt and actor John Wayne, have tried in vain to find a way to stop the shaft from flooding. Over the years, it has been assumed that this elaborate man-made structure must be hiding something extremely valuable. Could it be lost pirate treasure? Or the lost Crown Jewels of France? Or perhaps the riches of the Knights Templar? The most popular rumor is that Captain William Kidd hid his pirate treasure on the island before his execution. However, to date it is all rumors and speculation. Whatever lies beneath the sea on Oak Island remains a mystery to this day. There's even a History Channel TV show about it: The Curse of Oak Island. While it sounds like the mystery is very close to being solved by the island's current owner, Dan Blankenship, one thing stands in the way of what would become the find of a lifetime: a treasure trove license. Until Mr. Blankenship and his team of mystery hunters can find a way to convince the government to give him a treasure hunting license, the mystery will remain unsolved. There is only one way now for visitors to see the site of this long-time mystery. Private tours are held just a few times annually by the Friends of Oak Island group. Their website has recently undergone an overhaul, currently they're offering $10 memberships that will enable members to purchase tour tickets before they open the tours up to the public at some point in the near future. Check out their website and consider making Oak Island and Nova Scotia your honeymoon destination! If you do decide to make Nova Scotia your honeymoon destination, and you do make it on one of the Oak Island tours, please let us know what you learn about the mystery. We are waiting with bated breath to hear the latest news as it breaks over the next year. Perhaps this will be the year that the mystery is solved once and for all! !